We are thrilled the The Rams are back in L.A. There’s an amazing event in October that combines great food, the Rams, AND raises much-needed funds for the Los Angeles Regional Food Bank. What: Taste Of The NFL Dinner with the L.A. Rams! Rams General Manager Les Snead and his wife Kara Henderson will be co-chairing the host committee, and Rams players will be in attendance to sign autographs and mingle with attendees. The evening will include a live and silent auction, signature appetizers from local chefs, specialty cocktails and live entertainment. Why: To support the L.A.Food Bank. Did you know that one in seven people in L.A. County experiences food insecurity? The L.A. Food Bank mobilizes resources to fight hunger and provides food to 320,000 people every month. Since 1973, the Los Angeles Regional Food Bank has distributed more than 1 billion pounds of food and in 2015 they distributed 52 million meals. Learn more about L.A. Food Bank here. L.A. Food Bank “Taste Of The NFL” Event Page. PURCHASE TICKETS (or become a sponsor). Our photos of the L.A. Food Bank. We’ve already bought our tickets (we are HUGE fans of both the L.A. Food Bank and The Rams), so hopefully we’ll see you there! #FeedLA #GoRams! 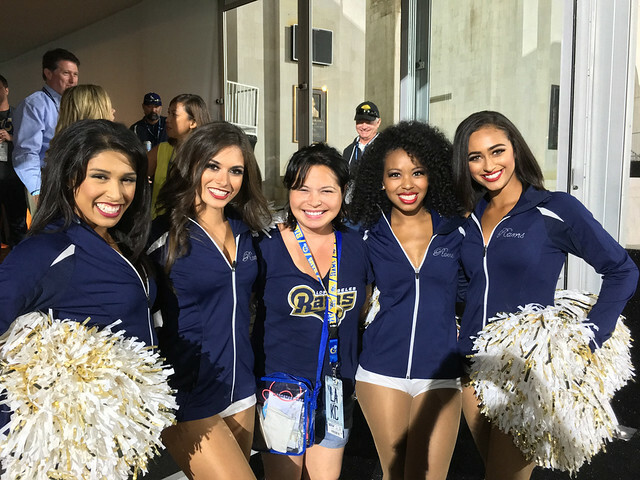 L.A. Bites Hunger founder Jo Stougaard (center) with the Rams Cheerleaders.